Why are men earning less than ever before? The answer may lie in the type of work they do. Ever since Hanna Rosin's Atlantic essay "The End of Men," there's been great speculation about the effects of the ongoing economic crisis--as well as the broader, longer running economic transformation that the recession is part of--on the relative economic positions of men and women. Some have even gone so far as to dub the current crisis the "mancession," though male employment appears to have turned up a bit recently. Alex Tabarrok's insightful post at Marginal Revolution bears on this issue. Take look at the two charts from his analysis below. 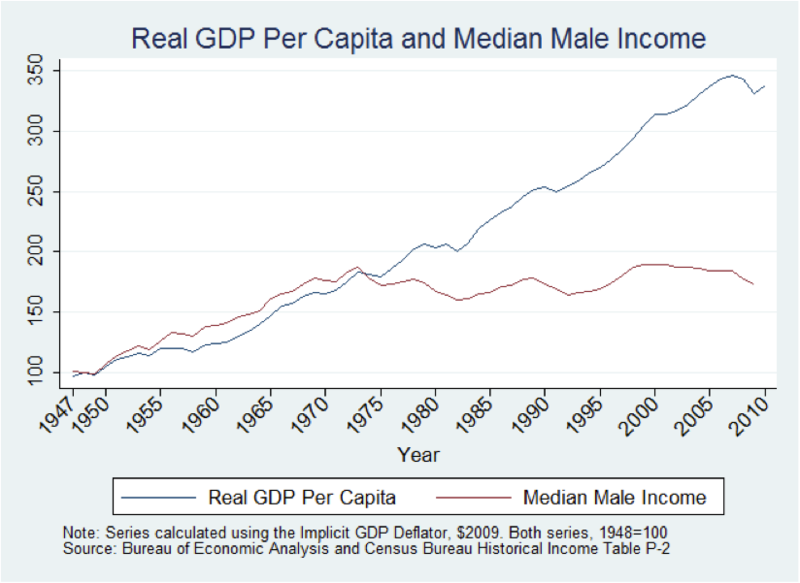 The first compares the rate of growth in real economic output (GDP) per capita to median male income for the period 1947 to 2010. The second does the same for women. 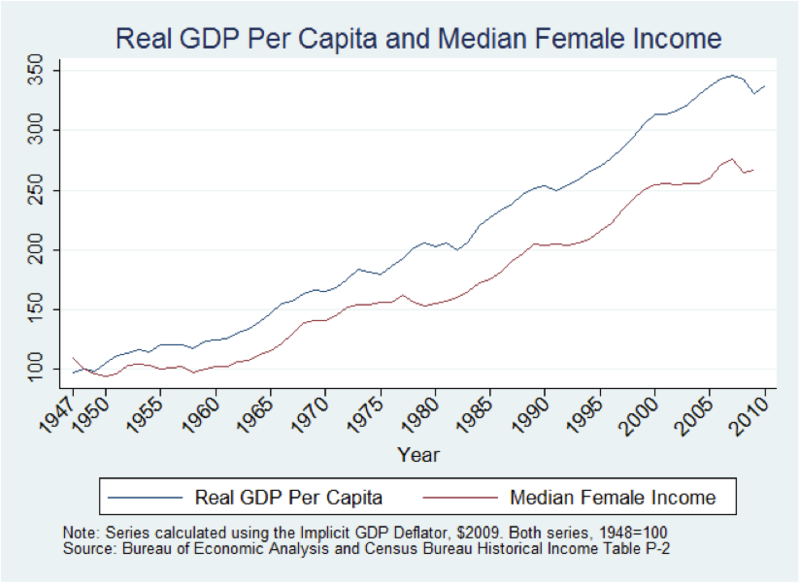 As Tabarrok notes and the charts make clear, "Median female income tracks real GDP per capita much more closely than does median male income." He offers the following explanation. The big difference between female and males as far as jobs, of course, has been labor force participation rates, increasing strongly for the former and decreasing somewhat for the latter. Most of the female change, however, was over by the mid to late 1980s, and the (structural) male change has been gradual. Other differences are that female education levels have increased dramatically and male levels have been relatively flat. Females are also more predominant in services and males in manufacturing: plumbers, car mechanics, carpenters, construction workers, electricians, and firefighters, for example are still 95%+ male. Putting these together points to a skills and sectoral story, probably amplified by follow-on changes in labor force participation rates. The graphs below, developed by my colleagues at the Martin Prosperity Institute seem to be in sync with this basic story. It tracks the wage returns to three different kinds of skills-- analytical, social intelligence, and physical--across more than 800 occupations. (The wage data are based on the Bureau of Labor Statistics and the skills components of the occupations are from the U.S. Department of Labor's O*NET survey). 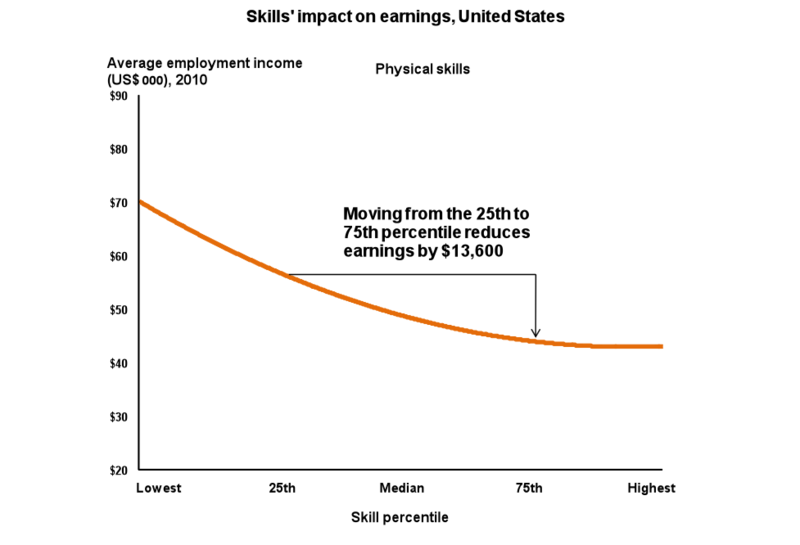 The analysis shows how wages change as occupations require higher levels of each skill set. Even though we do not currently have data on the skills by gender (we're trying to track it down), we can infer a simple story. Source: Martin Prosperity Institute analysis based on U.S. Bureau of Labor Statistics, O*NET 12.0 database. 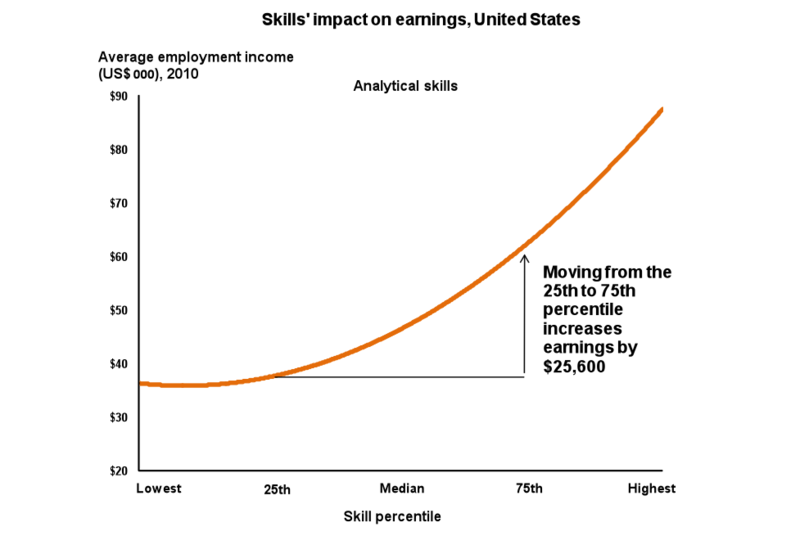 The returns to analytical skill rise consistently across the skill distribution; moving from the 25th to the 75th percentile increases earnings by more than $25,000. 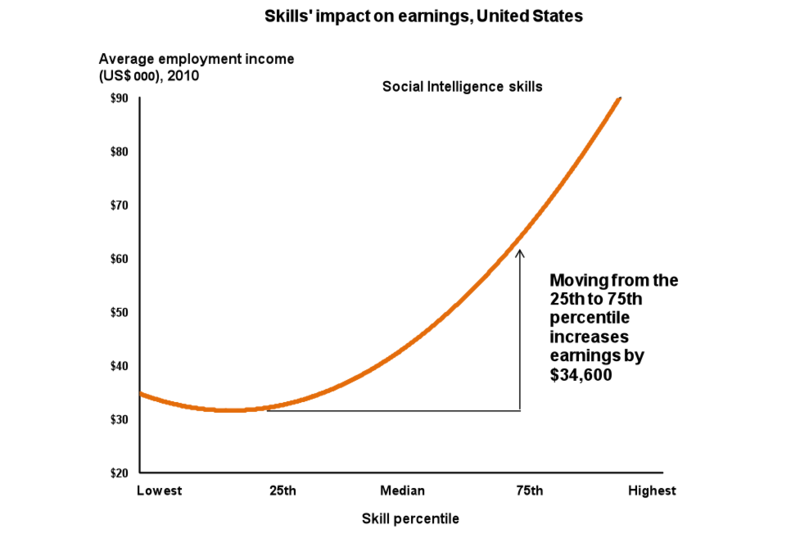 The same basic pattern holds for social intelligence skills, like teamwork, communication, people management, and so forth; moving from the 25th to the 75th percentile increases wages by nearly $35,000. But physical skill is different, registering decreasing returns. Moving from the 25th to the 75th percentile lowers earnings by $13,600. It is this last skill group that is almost exclusively the province of men; the other two are quite a bit more mixed. These results seem to support Tabarrock's story. Some of the seeming crisis for men reflects the fact that women were entering the labor force and graduating colleges in greater and greater numbers between 1947 and 2010; they had more room to climb. And women have logged consistently more working hours over this period, while men's working hours have stayed more or less constant. Still "men's work" as it was once understood--low skill, relatively well-paid physical labor (good factory jobs, in a nutshell)--is clearly the victim of the deep structural change in the economy. For the past several decades, the combination of technology and globalization has not only reduced the number and share of high-wage, low-skill production jobs that were once the province of male breadwinners. On top of this, the rate of return to these physically-skilled jobs has declined. Post-industrialism has dealt this kind of work--and the men who do it-- a very serious blow, one from which it will be very difficult to recover.